Sometimes all we need is a shift in perspective. This talking stick was created with so much love last summer for the kids we visited in Memphis at St.Jude’s Childrens Hospital. We gathered the wood from Sequoia National Park and lovingly spent time sanding and lacquering it, decorated it with feathers, ribbons, pipe cleaners, and love. It isn’t the traditional colors of any tribe, but it is powerful none the less. The last time this stick was held it was by these children that were so sick yet so grateful, loving and compassionate. I can’t lie. That day in the hospital was one of the hardest of our lives. My heart broke to see these little ones with no hair and attached to lines and machines and to see the exhaustion and sadness (mixed with hope and love, and a joy because for a few minutes their kids were smiling) in their parents eyes. I had to hold space for them as I taught them yoga and games. I had to laugh and smile, which was actually easy because they were so amazing, dancing and singing and laughing with Wuf Shanti. But when we got to the car, we cried deeply and hard for a long time. When I got home I packed this stick away. It felt too sacred to share. Too emotionally charged for me. Yet as we prepared our lecture for teacher training today, we had the idea of using a talking stick to teach about compassionate listening. I remembered this creation made with such love and shared with love, heard it calling to be of use again. So it was and so it is. Thank you for letting me share it with you! And thank you to those of you that always listen to me with compassion. 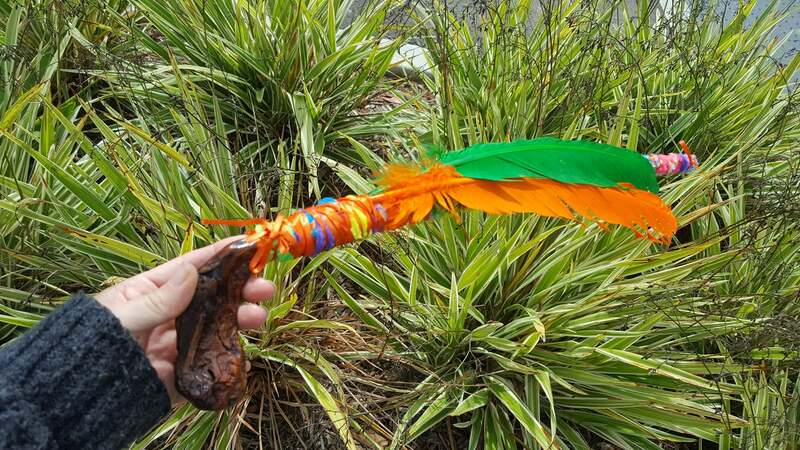 For children, we sometimes call it a Peace Wand, and make it magical, to let them know that they can share peace and kindness, and also create and accept it within themselves. Whoever is holding the peace wand, has the right to speak while everyone else listens. The kids can also make the talking sticks themselves. It is a mindful art activity, which can then be used for introductions, quiet time, exciting news, or whatever is making them happy or sad. They speak from the heart, and it teaches respectful mindful communication, listening, social emotional learning, and empathy. Adam, who is now 14, created Wuf Shanti for kids to teach mindfulness techniques in early learning, so children can live in health and wellness, peace and positivity. Through music, fun, and games, children learn Yoga, meditation, and positive thinking to help them think well, be well, and live in light. These techniques help children to stay physically fit, mentally less stressed, able to cope with emotions, and interact with kindness. Wuf Shanti is a recipient of the prestigious Mom’s Choice Award and named among the “Best in Family-Friendly Media, Products, & Services.” Common Sense Media named Wuf Shanti’s Mobile App, the Yoga Fun Machine, one of the “Best Health Apps and Games for Kids.” National Parenting Product Awards (NAPPA) names Wuf Shanti “Best Product for Children” in their Health and Wellness roundup. You can read about Wuf Shanti in the recent press in Teaching. com, Best Self Magazine, Care for Your Mind, LA Yoga Magazine, Superfly SuperMom Blog, the Huffington Post, Thrive Global, Miami Herald, Yoga Digest, The Doctor Weighs In, Sun Sentinel, Integral Yoga Magazine, and many others. The articles can be found on this website in the “In the News” section. Some of these publications were interviews or articles, written by other people about Wuf Shanti, and some of them are articles Adam wrote which were published by news outlets or magazines. Adam also conducts his “Partners for Peace” interviews with pioneers in the Yoga, meditation, and mindfulness communities, which you can listen to or read on this website in the “Interviews” section. During the most recent Mind & Life Institute Conference which focused on Mindfulness in Early Learning, the Dalai Lama said that “we must scale up” and teach these important tools during early learning years if we really want to stop the violence and make a positive impact on the world for the next generation. Please join us in our mission to heal this planet and make it a better place for our kids.